Map of the 'World's Most Scenic Railroad'. 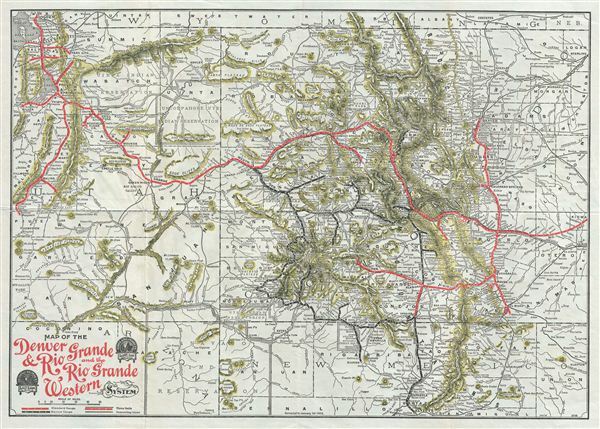 This is a fine 1904 Map of the Denver and Rio Grande and the Rio Grande Western Railroad System. The map covers the Denver and Rio Grande Western Railroad running through the states of Utah, Colorado and New Mexico. It shows the standard gauge and the narrow gauge in separate colors. Now defunct, the Denver & Rio Grande Western Railroad was at one time the largest North American narrow gauge railroad network, famous for its mountain hugging tracks. Historically called the ‘Most Scenic Line of the World,' most of the Denver & Rio Grande Railroad lines are now operated by the Union Pacific Railroad. There are also various lines which are now operated as heritage railways, including the Rio Grande Scenic Railroad, which operates from Alamosa, La Veta and Monte Vista in Colorado. This folding map was created in 1904 showing the Denver and Rio Grande Western Railroad System. Very good. Original fold lines. Blank on verso. Minor verso repair extending 1 inch over right center margin.